500m from Levante beach in the lively shopping area of Rincon-de-Loix, this hotel is in the heart of it all, in close proximity to the local shops, bars and restaurants. I booked a hotel through travel republic I was travelling three nights my counterpart 4 nights. I contacted travel republic to inform them of different check in dates but as I had arranged and paid for the booking my friend could not check in for the extra night paid for. After several calls to travel republic waiting on hold for up to thirty minutes each phone call they said that this was the terms of their travel partner ( which are not available to read online!). Lesson learnt. Do not ever book through travel republic if booking hotels and flights separate always book direct with the hotel or airline provider!!! Do not use ? Room was far too small for 3 & we were charged a fortune. There was no space for our clothes The disabled room for my dad was not suitable. Not a full wet room. Flooded bathroom & hallway every shower. No room to get a walker near toilet & wheelchair would not fit through bathroom door. No proper bar open at all & entertainment terrible. Pool area was overcrowded & limited access for wheelchairs. There were 2 pools but small. Waited ages for lifts every time & at night there was no lights on the staircases. Food reasonable but it got cold whilst you queued for different compliments to meal. Did not feel like a 4*. We booked direct with the hotel as it was cheaper than the bed banks. The hotel is mainly all inclusive. There are 2 towers, one with 7 floors and the other with 21 floors. We had booked a superior room and it was well worth it. It was a huge room with twin beds at one side and two 2 seated white sofa beds and coffee table at the other. There was a desk next to the sofa with a CRT TV which had BBC1 and ITV1, but no Sky. The double built in wardrobe housed the safe and had 4 fairly shallow drawers. There were only 5 hangers at one side and 2 at the other. There was a cupboard which housed the mini fridge and there were 2 shelves above. There was a floor to ceiling mirror and there were glass panels in the wall which shone light from the bathroom into the bedroom. The balcony was massive at approx. 20ft x 6ft with a round table and 2 chairs. There was no airer and no light. The bathroom was large, modern and spotless with a round toilet and bidet, a square sink with plenty counter space, a bath and separate shower enclosure. Sachets of shower gel and shampoo were provided along with soap and a shower cap. There were no tissues which you normally get in a 4* hotel. There was a hairdryer. The food ranged from good to very good one night to just OK most of the time. However there was a lot of choice and you wouldn’t starve unless you were extremely fussy. You get drinks from the bar in the restaurant and we were offered either a glass of wine or a bottle and either a glass of beer or a jug and the same with soft drinks. The wine was good, but not very strong. There is a cafeteria bar where the entertainment is held on Floor -1 and a large lounge where karaoke is held on Floor 0. Drinks were quite good, especially the cocktails. There is a spa with a beauty salon and hairdresser. Use of the spa indoor pool and gym are free for all inclusive guests or €9 a day for others. A swimming cap and suitable footwear is required and can be bought outside the hotel cheaper than the spa. There is Wi-Fi in the hotel and you buy access from a machine opposite the reception desk. €1 for an hour, €3/12 hours, €5/3 days, €15/7 days or €25/month and it gives you a receipt with the username and password. Sleep quality wasn’t very good the first night. The bed was quite firm which was OK, but the pillows were lumpy and one had an old, bobbly pillowcase. However the maid provided another pillow and there was no problem after that. The shower was good and powerful. However the hinged glass door let water out, it had a fixed head and there was nowhere to put shower gel, shampoo, etc. There is a bus stop right outside the door going towards the Old Town and directly opposite the hotel towards Albir and Altea. We would certainly stay here again as the location is good and the positives outweighed the negatives which was really just the food some days. We went in January; the heating in the bedroom was adequate but cold throughout the rest of the hotel. Several people kept complaining each evening for the heating to be switched on. The entertainment was very poor and the bar we used did not open until 9.00 PM. Someone complained and the opening was changed to 8.00 PM. We always waited ages every time we used the lifts so we walked across an open walkway to the old part of the hotel to use their lifts, it was much quicker. Room cleaning was average, nothing to write home about. Food was acceptable though getting it, required joining different queues. One for starters, another for hot meals, another for chips and hot vegetables and a fourth for salads. The location of the hotel is some distance from the beach, beach-shops and town centres. So be prepared for long walks or use transport. We would never ever return there, ever again! 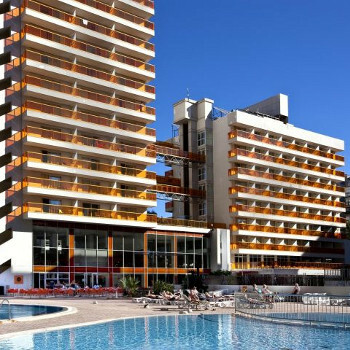 This must be one of the most clean hotels in Benidorm -its spotless. We found food to be good and because it caters for the Spanish we got regional dishes also which we enjoyed. Hotel is in a good location and there is a bus stop right outside the hotel if you can't manage to walk right into the Old Town. The staff were very friendly and helpful. There isn't a lot of entertainment. At the end of our week the 2 animation team came over to say goodbye to us all that were going home the following day which was nice. We had a short break 4 night stay and found on our arrival very good English speaking reception staff, booked in very quickly. Very large reception area with lots of soft seating areas. Lots of glass and were able to see outside wherever you stand. We were on the 5th floor with two available lifts. Room was large although for a two week stay the wardrobe was very small but adequate for a 4 night stay. Bathroom was very really nice and bright. Beds - large and comfortable with TV in the room. The veranda we had being at the end of the corridor was large and you were able to sit out and watch life go by as the orange glass was see through. Rooms are cleaned and towels changed on a daily basis. The hotel has spa facilities although we did not use it. We also did not stay in to watch the entertainment so cannot comment. There are daytime activities, with sangria and paella exhibitions where you try for free when ready. This hotel has a very large dining room however I would not rate the food 4* I have had better in a 2* the food was cooked in the back but felt it lay there quite some time before being brought out, therefore cold! the soup was no better. There is a cooking area where you can watch either fish or meat being booked if you are lucky and in the queue at the right time then you would get this hot, however one evening I noticed that the guy was cooking tuna (which I love) but he cooked it far too long and ended up hot but tough/rubbery - sorry but tuna only needs 2 mins on each side! Breakfast was same cooked breakfast every morning, with the usual bread / rolls, cereals and fruit. All in all a very nice clean hotel, I would go back on bed and breakfast only. the location was superb, away from noise but close for 5 min walk into centre. which you needed to do top walk off the fantastic food served at meal times. the food was definately 5* with everything hot, fresh and loads of choice. the only downfall was that they didnt cater for childrens food, or entertainment, tho at the time there was no children in the hotel. the staff were very freindly and helpful, spcially PETE! now for the bad points... entertainment. there wasnt any. this didnt put us off as we went out into the centre for the entertainment. just came back from dynastic hotel. it's true what people say rooms are nice,food is the worst i've ever had everything has garlic on and is cold can't even get a hot chip,pool area dirty looking with broken sun loungers,entertainment rubbish. would not recommend this hotel to my worst enemy!!!!!!!!!!!!! We stayed in dynastic hotel on an all inclusive basis the hotel itself is quite nice and clean the rooms are large and cleaned every day. There are no stairs in this hotel only lifts which are a nightmare they are either full or somebody is going up and you are going down or you are stood for ever waiting for the lift in the first place. The pool area outside is a poor excuse for a pool it is far to small and generally uninviting. You are not allowed any ball games in the water no fun at all. The food in the hotel we found to be terrible it was fish,fish and fish, after the second day we gave up and eat our meals out I would never go to this hotel again. we have just returned from the dynastic park hotel where we went with our two kids,we were looking forward to a family holiday with entertainment for all the family thrown in. on first impressions the hotel looked fine but has we ventured down to the pool area there was something very notacable "very few english" never the less we gave it ago but to our disgust the entertainment programme was entirley spanish leaving our son with nothing to do and ignored.the evening programme was even worse and to be honest embarrassing has i didnt have a clue what was going on has again english speaking just didnt happen. the food was the same day in day out and often luke warm, whist the snacks were hot dogs and burgers and cold chips. the rooms are clean and spacious and comfortable but getting a lift to higher floors often took around twenty minutes has there is only two in the main block which has over twenty floors. the rep was useless and told us to join the club of complainents whilst staff of the hotel would ignore you in favour of serving spanish guests first. there is no way i would reccomend this hotel and if you are thinking about going unless your fluent in spanish dont bother.